The markets for these types of product have taken much longer to evolve than originally anticipated. Although the market for DNA microarrays is now well established, there is still scope for technological innovation of an incremental and disruptive nature. With a few exceptions, microfluidics is at an earlier stage of development for life science applications and, despite the potential, looks set to take a while to really invoke a paradigm shift. 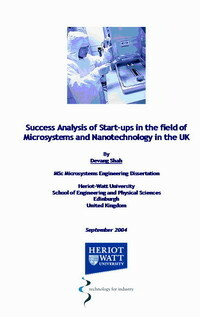 Do you need to know how Nanotechnology and Microsystems could….. Enhance your existing products to gain competitive advantage? Identify opportunities in the market place? This latest report from TFI ‘s Market Sector Report collection has 15 chapters including two appendices. Within the sections list below, the standard format includes a market overview, industry size and trends plus technological developments. * if you have any questions concerning pdf files, please click here.